Join Chelsea doll for a magical ride in her Barbie Dreamtopia magical dreamboat and let your imagination soar to your favourite Kingdoms! this is the perfect vehicle for exploring Dreamtopia - the bed that turns into a flying boat has so many of sweet-as-can-be surprises! roll the vehicle forward on its hidden wheels to see the wings flap and the hot air balloon spin. 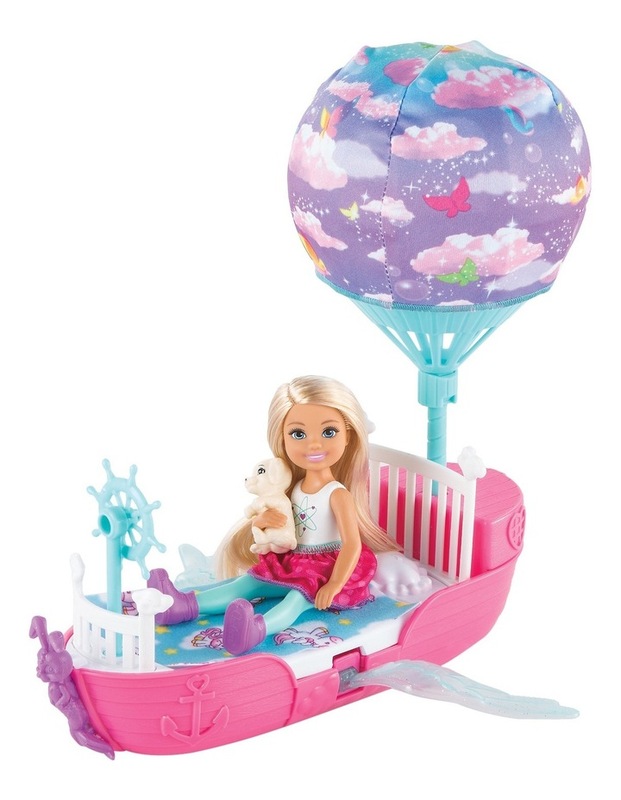 With pink clouds, bright colours and butterflies, this balloon is Dreamy to watch again and again. Let Chelsea doll "steer" at the ship's wheel or have sweet dreams under the blanket as you lead the way; there's even an attached pillow for Chelsea doll. Colours and decorations may vary.